Sarah Berry is all smiles for her national meet. 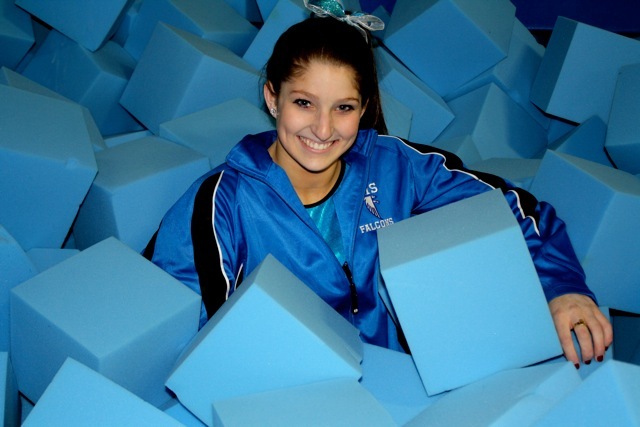 Danvers, MA—While Danvers High School students will be dancing at their senior prom on May 20 at Boston’s Seaport Hotel, senior Sarah Barry, 17, will be flipping across a four-inch balance beam, competing in the gymnastics meet of her life. Barry has no regrets. 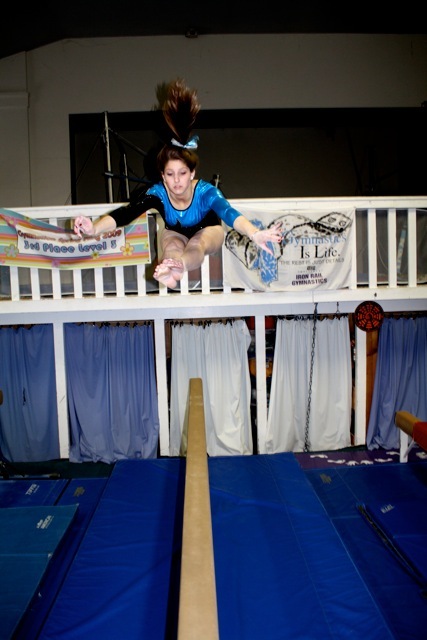 In fact, since she found out that she, along with 22 other gymnasts, had been chosen to represent the state of Massachusetts at the National High School Gymnastics Association Senior Showcase Invitational in Fort Myers Beach, Florida, May 20-21, 2011, she’s already begun training. A selection committee, made up of Massachusetts’ high school gymnastics coaches, nominates gymnasts to watch throughout the season for their anticipated success. Members of the committee let the gymnast know they are being observed for the national opportunity and offer suggestions for improvement, according to Heather Boepple, 28, Danvers High head gymnastics coach. Barry, who took committee members’ advice and worked hard to improve her routines, was chosen based on her “coach-ability” as well as her gymnastics talent, said Boepple. Known also for her consistency and dependability, Barry, a captain of the Danvers Falcons, often scores in the 9.0’s on beam. She even scored two 9.4’s, her season high, at two separate meets in the same day. Among her other accomplishments, she was given the Coach’s Award for the 2008-2009 season, chosen by the coaches and given to the gymnast who stood out to them throughout the season because of their contributions. She was also named an NEC All-Star for the 2010-2011 season and placed 7th on beam and 10th on vault at the state individuals competition this year. Barry, a four-year veteran for the Falcons, currently practices at Iron Rail Gymnastics in Wenham to prepare for the national meet in May, knowing many of her friends will be preparing for their prom while she’s away. Instead of riding in a limo, she’ll be flying to Florida for the national competition. But Barry says it’s worth it to miss her prom. “Competing on this team is a privilege and it is an honor to be chosen. It is a once in a lifetime opportunity for me,” she said. I like your post, thanks..
this post is unique information, thanks..
awesome post, thanks for your sharing.. Thanks a lot for informing us this news. Really it's very great blog thank you very much. Life is not pink and more people have realized that. The larger the more people feel they are disadvantaged, have always been treated unfairly and betrayed by those around them. To overcome it, I had to be content with life now, satisfied with what is there. "ExamTayari, How to Crack IBPS, SSC, PCS, IPS, NDA, GROUP C, LIC, PO, Clerk, CGL, RRB NTPC, Other Exams, Latest Exam notification, Online Exam preparation for banking and Civil services exam, Best Books to prepare for competitive exams." I Like your Article On This Topic. thank you for this article. I never in my wildest imagination think that i would find this kind of a post, its very interesting and provides the best kind of information. Comments reviewing I really hope to see this kind of information once more, it gives the readers a chance to get acquainted with every days happenings. hpm masih membuka peluang varian baru yang dilengkapi turbo. tapi, ada syarat yang dijsaudara termudaan pertimbangan. paling utama yakni keuntungan dari terpangkasnya pajak penjualan atas barang mewah (ppnbm). pt suzuki indokendaraan beroda empat sales (sis) lagi menghadapi permintaan tinggi para konsumen, atas model barunya yakni suzuki ignis. suzuki tetap optimis suzuki ignis mampu terjual .000 unit per bulan. Berbeda dengan Volt, Nissan e-Power tidak dapat diisi listrik secara eksternal (plug-in). Sistem ini menghemat bahan bakar, karena mesin terus beroperasi untuk menghasilkan listrik, bukannya menyala seperti mesin konvensional untuk menggerakkan roda. berikut simulasi paket kredit dp ringan daihatsu sigra balikpapan, samarinda – kaltim sekitarnya. perhitungan kredit daihatsu sigra dibawah belum termasuk diskon/ cashback. fascia bagian depan toyota etios valco tampil kminuman beralkoholter seranganf nan sporty lewat headlamp ber persegi panjang ujung runcing menjorok ke sisi luar. pt nissan motor indonesia (nmi) beberapa waktu lalu membawa 150 siswa sekolah menengah melakukan kunjungan pabrik. hal ini dilakukan untuk melihat dari dekat proses perakitan kendaraan beroda empat nissan juga datsun di purwakarta, jawa barat. nissan perkenalkan dunia otomotif ke siswa lewat kunjungan pabrik. pt honda prospect motor (hpm) sebagai distributor pemegang merek honda di tanah air menghadirkan kendaraan beroda empat honda civic turbo. banyak promo menarik bagi honda civic turbo pada iims 017.
pt mmksi menawarkan voucher belanja senilai rp 1 juta untuk para konsumen perempuan yang membeli kendaraan beroda empat mitsubishi di iims 017.
this site has posts that are very useful for me, with this website definitely has good and professional writers to make articles like this.